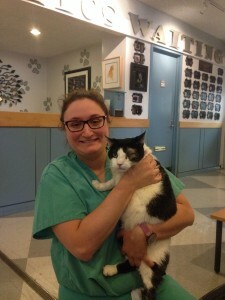 Red Paw Emergency Relief Team, the Philadelphia non-profit that helps pets displaced by house fires, has gotten some high profile coverage in recent days, with a CNN Heroes profile of founder Jen Leary (see Rescue Hero Helps Pets affected by Fires). 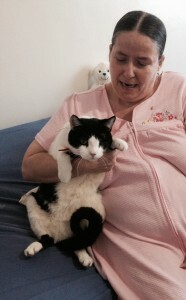 Earlier this year, a cat named Spotty, who had been in the care of Red Paw following a fire, was returned home to his petmom. 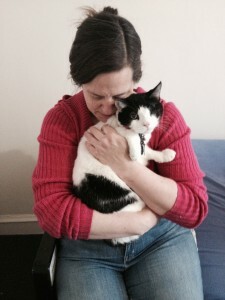 Our post from January 19, Spotty Cat Goes Home, includes the touching video of his homecoming. 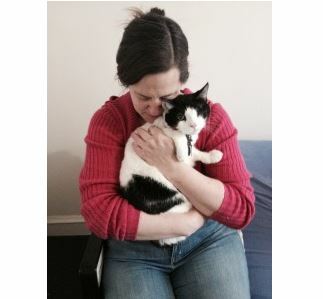 Here is Spotty’s story, as told by his foster caregiver. Although he was reunited with his owners over a month ago, whenever I look at my kitchen chair, I think of Spotty (Cat) Cow. Some would wonder, why would a chair remind me of a cat?? Well, it’s due to the fact I was sitting in that chair the morning I took a call from Red Paw founder Jen Leary, telling me that a feline who was involved in a house fire several days prior had run out of the burning home, gone missing and then showed up at the University of Pennsylvania Emergency Veterinary Hospital after being hit by a car. 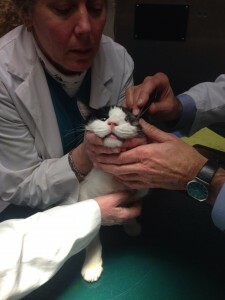 Thankfully, all the cards lined up in Spotty’s favor; a good samaritan brought him in following the accident and since the staff at PennVet follow the Red Paw Emergency Relief Team Facebook page, they had read about Spotty’s story and knew he had been missing. The tech said she smelled smoke on him, knew he had been hit by the car in the same area as the fire and called Jen immediately! 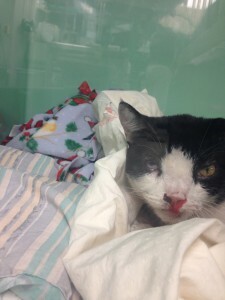 Ode to Spotty Cat was originally published at the Red Paw site’s blog. Reprinted here with permission.